Cut the beef into 5mm cubes. Using a pestle and mortar crush the garlic cloves, the shallots and the lemon grass. Place the beef in a bowl with these ingredients (garlic, shallots, lemon grass) and add two tablespoons of peanut oil. Season lightly with salt and pepper and add two tablespoons of Nuoc Mam. Mix and leave to marinade for a couple of hours. Boil 5 litres of water in a large pot. Once at boiling point reduce to a low flame. Add the trotter and knuckle of ham. Leave to simmer for 2 to 3 hours. From time to time remove the froth from the water so as to obtain a clear broth. Heat up 2 tablespoons of peanut oil in a pan. 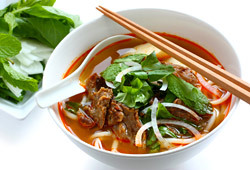 Once the oil is hot, add the 2 teaspoons of Bun Bo Hue spices. Stir rapidly without stopping. Still on a high flame, add the marinated meat. Stir without stopping and once the meat has the right colour add the 2 tomatoes cut into 8. Continue to stir until the tomatoes are completely cooked. Place the contents of the pan into the large pot. Pour 3 ladles of broth and the Mam Ruoc into the pan and stir until the paste has dissolved. Pour this mixture into the large pot. Crush the rest of the lemon grass with a rolling pin and then cut into lengths of 10cm before placing them into the pan. Cut the onions in 2 and brown them in a pan with a little oil, turning from time to time. Once the onions are well browned, add them to the broth. Then add the cinnamon, 10 tablespoons of Nuoc Mam, salt and pepper. Leave the pot as such on the flame for two and a half hours, uncovered. Once cooked, take out the knuckle and cut into slices. Take out the pieces of meat and the trotter and drain, during which time wash and drain the herbs. For the vermicelli, boil a pan of water and add the noodles. Once cooked place under cold water and drain. In each bowl, put in some vermicelli, some meat, a few slices of knuckle and a piece of trotter. Then pour on the broth so as to cover the meat. Empty the broth from the bowl into the pot and pour back in again the broth so as to heat the meat and noodles. Add to the bowls a little white onion, Rau Rum, a slice of lime and some crushed black pepper.